The kitchen is gaining more and more prominence inside a home. What used to be only a place to cook in which little time was spent, has now become the meeting center of the house. That’s why more and more companies offer integral solutions to create kitchens if you dream that it is a pleasure to spend some time with the family. IKEA is one of them, and then we’ll take a look at their kitchen cabinets. IKEA has made an important and famous name because it has sought and found the compromise between quality and price: its products are aesthetically pleasing, designer, modern and fresh and practical, but still maintain a price affordable to most customers. Its catalogs contain a vast range of economical and functional furnishing solutions. And all this is with the guarantee of IKEA. Not only that, IKEA also has a strong environmental sensitivity towards ecological and humanitarian problems. The IKEA brand has spread widely throughout the world thanks to the ease of use and the wide range of furniture and accessories offered in its catalog. Thanks to the special care in designing almost all IKEA furniture can be purchased, transported easily and assembled in person in their home by those who have a minimum of do-it-yourself skills. In any case, it is possible to request a home-delivery service for a fee; in this case the work will be carried out by skilled craftsmen, proposed by the same IKEA. The kitchen cabinets that adapt to you and your way of using the kitchen save you time and effort every time you cook. 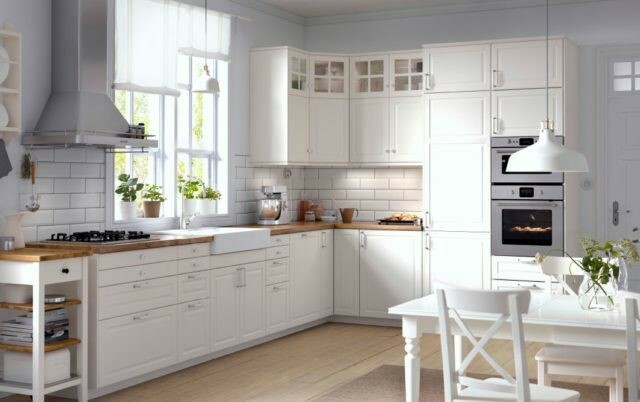 IKEA have a wide selection of cabinets including models designed to place appliances, so you can design a kitchen to your taste and at prices that will make your dream come true. The cabinets for the IKEA kitchen have not lost their popularity all over the world for years. Designers of the Swedish brand manage to create furniture that meets virtually all modern requirements and allows you to make a comfortable and functional interior. 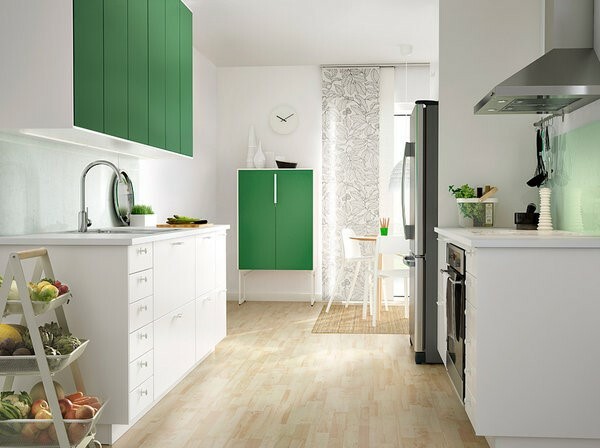 IKEA kitchen cabinets (or basic modules) are part of the furnishing solutions of an economic category and for this reason there are many people who question their real value. When you have to buy a kitchen, generally, you pay much more attention to the quality of furniture and appliances because you know a kitchen can last even decades! Precisely for this reason, often and willingly, people choose to turn to more serious and expensive furniture for the purchase of the kitchen but this decision does not always turn out to be a winner. In addition, not always expensive kitchen furniture is distinguished by good functionality and is really useful within the kitchen space. 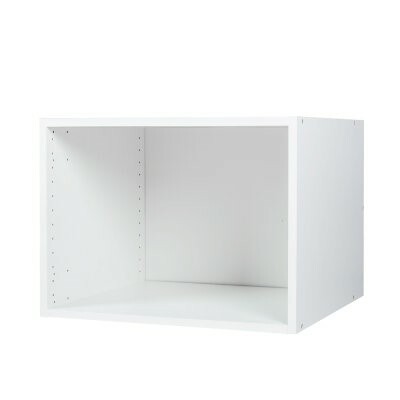 METOD Base cabinet € 28, 60 x 60 x 80 cm. The cabinet is of resistant construction: 18 mm thick. Coated with melamine, an easy-to-clean material that is resistant to moisture and scratches. Choosing a model within the wide range of IKEA kitchens can be a good solution because there are several advantages: first of all, the prices of these kitchen cabinets are really competitive and would tempt anyone. 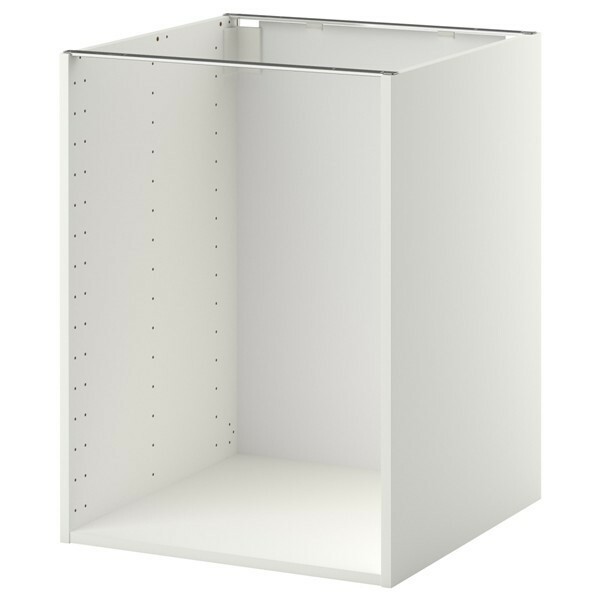 METOD Corner base cabinet € 60, 88 x 88 x 80 cm. If you have a limited budget, the solutions proposed by IKEA for the kitchen are really interesting and the total cost is very low: just go to the official website to realize why. 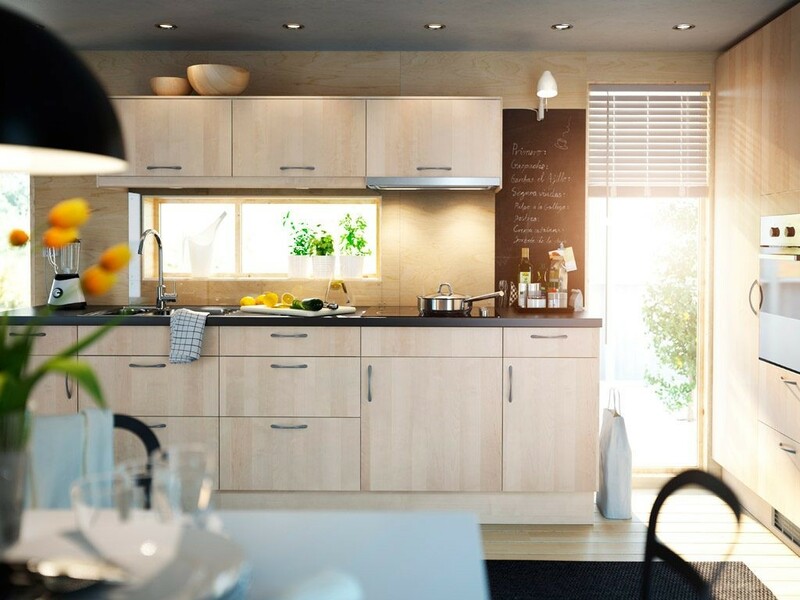 An element, on which we advise you to be careful if you intend to buy IKEA kitchen cabinets, is the home delivery and assembly service: if in fact the prices of base modules are definitely affordable, the same cannot be said about transport costs and on the assembly service. Keep in mind that, unlike other brands, IKEA kitchens are usually quite simple to assemble so consider also the possibility of arranging assembly, especially if your budget is limited. The same applies to transport: if you have the opportunity to go personally to an IKEA resale and transport everything with a vehicle at your disposal you should do so well rather than order everything online or at home. This will also avoid the inconvenience of possible delays, and will certainly save you a lot. In all cases, however, you should always check that everything has been delivered: it is not uncommon for IKEA to forget something or in the various blocks something is missing. Also carefully check the condition of the tops and of the various pieces of furniture: it would be a pity to find a defect after assembling the piece. The quality-price ratio plays a key role in the choice. In IKEA kitchens, you’ll find everything you need to achieve the style you want. 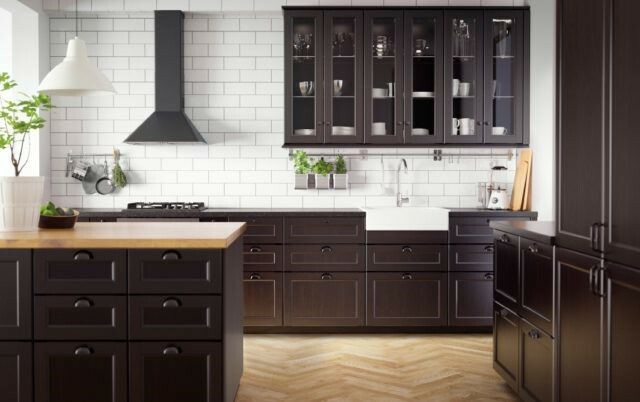 In addition to a wide range of cabinets and fronts, there are many sinks and faucets, drawers and handles as well as the practical interior organizers you need to make your new kitchen an organizational model. No matter whether your taste is more traditional or more modern, IKEA kitchens give you everything you need to create the style you love. The days were over when you had to choose between style and functionality. Now you can choose the exact functions you need and still get the style you want. In the same way, you can realize all your dreams with regard to design, without taking the practical side of your kitchen. You know, one of the most important factors when buying a kitchen is the guarantee that is assured by the retailer. Even in this IKEA does not disappoint offering 25 years of guarantees on possible defects in the factory and materials of kitchen cabinets. Attention! The warranty covers only manufacturing damage and only if the products have been kept in a suitable place and for suitable use! Thanks to IKEA you can run an online kitchen project through the kitchen planner, a simple program, available on the company website, which allows you to design IKEA kitchen with a few simple steps. To design IKEA kitchen it should be remembered that the different solutions for the kitchens are based on the Metod system, a modular program that allows a very high degree of personalization. Buying kitchen in IKEA has some traps. The basics like modular cabinets are ridiculously cheap, but every little extra is paid for, and some are very expensive. Multiply the price for each model by the amount of drawers you need and you will realize the difference. 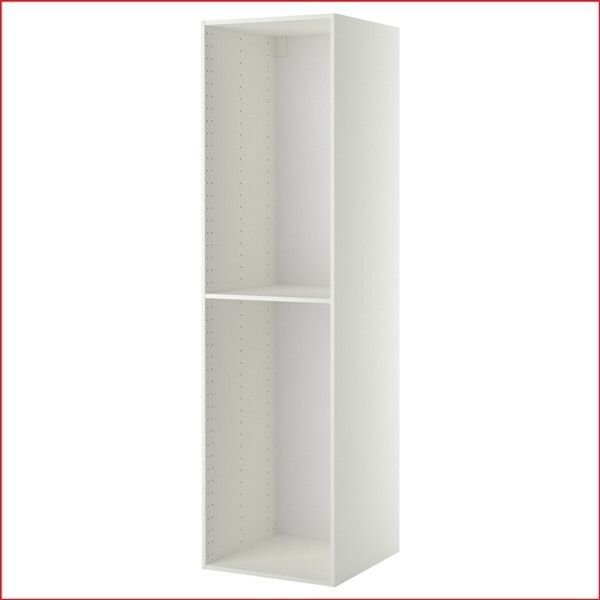 It is cheaper to fill the modules with shelves and doors than to do with drawers. Drawers are always more practical than cabinet with shelves, even if they costs more! This is the reason why Swedish kitchens fill up with drawers. Be conservative in the amount of drawers you need. If you buy removable models, you will see what’s inside more easily than in a base cabinet. For the corners there are solutions that rotate on rails or removable baskets that help us get to the bottom of the matter. IKEA did not invent them, but it is true that it has made them much more popular. They represent a convenient function. There is one interesting detail that each piece is sold separately. For example front for dishwasher in a nice light green color (Kallarp) costs 25 Euros. The same front with spectacular black wood effect (Lerhyttan) the price rises to 52 Euros while the rustic beige front (Bodbyn) costs 65 Euros. If you buy a piece of furniture to hang it on the wall, you should know that the door, the door hinges, the handle and even the shelf inside it are sold separately. It is a trick a bit dirty because a piece of furniture that apparently costs 25 Euros actually costs 85 Euros. We have also noticed that IKEA faucets and sinks are not particularly cheap compared to hardware stores. The big problem is not just the price. It is that, if you do not have the means for a particular moment you will leave pieces without buying and you will have to come back for them. The base modules are supported with adjustable feet in height with which you will have to play so that the whole set is horizontal from side to side and back to front (we do not want the eggs to roll). In addition, they have a system of anchoring to the wall, but do not install until the countertop arrives. If your kitchen is a little complex you probably have to move a module at the last minute so that the sink is in the perfect position. Once you have checked that the hob fits well it is time to anchor the modules to the wall and between them. By the way, however tempting it may be, do not use the row holes in the modules to fit the anchor bolts between one module and another. Those holes are for the drawers, and the chances of you getting the wrong hole and setting the screw where you are going to go a rail are high. Quality is a difficult parameter and we can begin by saying that IKEA is not, as some believe, synonymous with poor quality. In fact, the products of this company are regularly tested according to the law in order to withstand the daily wear and tear. In particular, the cabinet is subjected to a load test, one week, weighing 43.6 kg. The shelves of IKEA kitchens are subjected to a resistance of 1 kg to a square decision. The glass tops, on the other hand, if they are 80 cm wide, are tested with a weight of 13 kg for a week. The same tests are repeated for the drawers, the baskets, the fronts and the doors, to make sure that everything in the kitchen meets quality and safety standards. The low price is the result of a careful search for compromise between functionality, quality and aesthetics, which results in a choice of quality anyway. It is certainly high and adequate for brand (also in relation to the guarantee offered to those who buy an IKEA kitchen) although from a purely technical point of view (characteristics of materials, thickness, hardware, etc.) IKEA may be inferior to some other modular kitchen brands (for example, Arkrea Cucine). 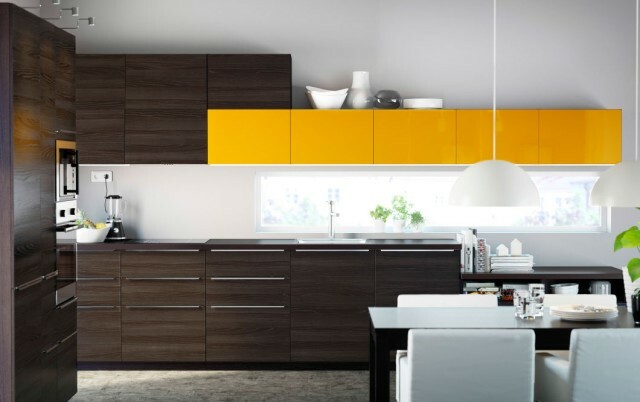 IKEA kitchen cabinets are made of particle boards covered with melamine film or medium-density fibreboard (MDF) varnished. A thin layer of plastic material called melamine formaldehyde is applied to a chipboard support, able to make the surface waterproof and very resistant. The box’s side, bottom and top panels are usually 18 mm, the frame is strong and durable, and the material does not crack and maintains the increased humidity of the kitchen room. 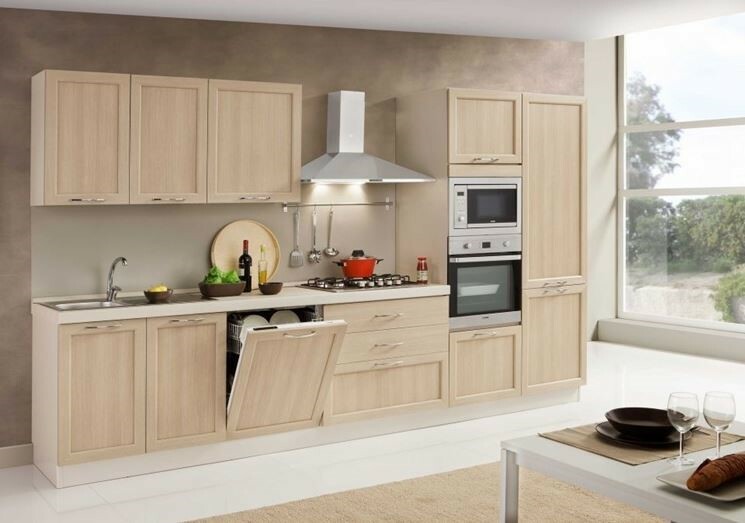 The company offers various sizes of kitchen cabinets including in one set. You can choose different modules in height and width in the same color scheme and design. This is very convenient for small kitchens where every square centimeter counts. You need to know that the depth of almost all the modular kitchens is 60 cm and that the basic module for the development in length is 15 cm. 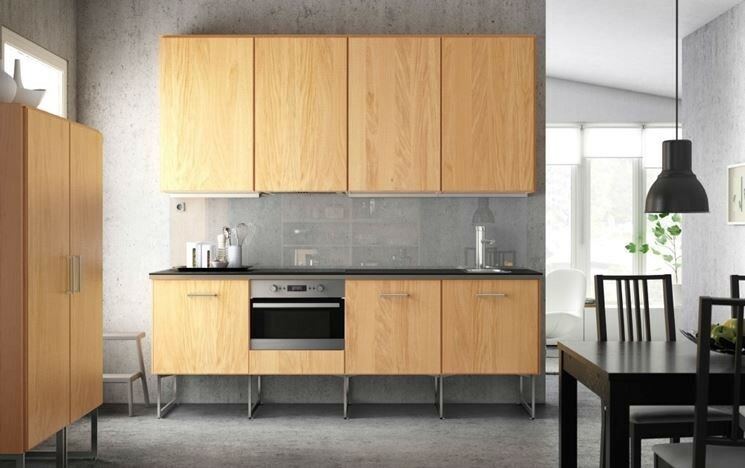 IKEA kitchen cabinets can be bought separately and do the assembly with your own hands. The facades (or doors) are made of chipboard, MDF, wood and steel. Wood (even if it is not very expensive) or stainless steel (that contains chromium and resists corrosion) not only improves the appearance, but also seriously increases the performance characteristics of kitchen furniture. METOD basic modules are available in different sizes ranging from 20 to 80 cm wide (20/40/60/80 cm). They can be combined with doors, drawers, handles, knobs, hinges and different appliances, for a different kitchen every time. For frames, there are two primary colors: white and dark brown. The color scheme and style of the facades is more or less diverse. There are facades glossy, veneered, and painted. The colors are almost always very soft and the materials chosen almost never leave room for the ostentation of luxury. Despite the fact that they are mostly basic and neutral but there are doors of bright colors to create a kitchen in modern styles. A light brown color is a perfect tone for the season. 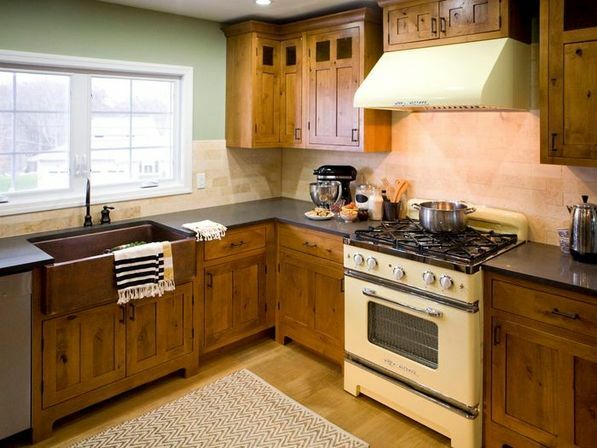 This kitchen is with a strong rustic style, with light wood tones and the sensation of seeing the wood’s own grain. We think now you can easily choose a combination of almost any idea for the interior. Of course, as you will remember, you can assemble yourselves at home or you can hire specialized IKEA staff so that you have your kitchen ready at home. The white kitchen is a fashionable trend in modern design. White kitchen cabinets cannot fail to attract attention. Almost every housewife represents her kitchen in white. True, not everyone decides to put this into practice for fear of the fact that white kitchens are easily soiled. IKEA cabinets are easy to clean, and many types of dirt to them simply do not stick. Very stylish kitchen is in black. 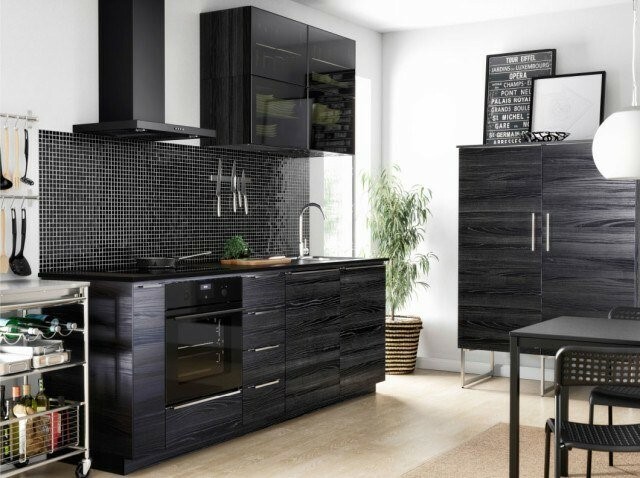 An element to highlight in terms of IKEA kitchen furniture 2018 is that the black color will have more prominence than in previous times, so you will find kitchen models in dark tones that will not happen unnoticed. 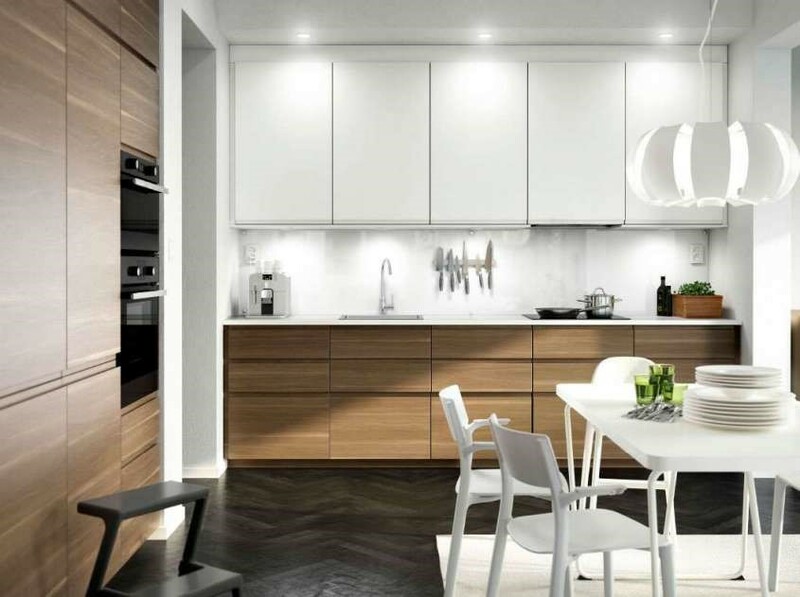 Although it is always said that it is better to choose the white colors to generate greater sense of spaciousness, those who want black kitchens for a small room, you can see that in IKEA they also bet on showing us that it is possible. 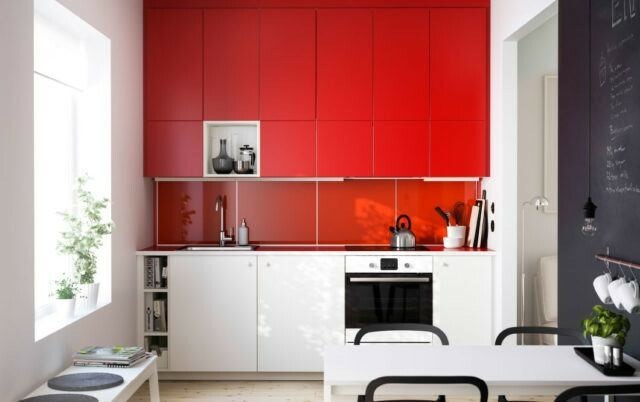 IKEA has two types of red kitchens with gloss or matt. 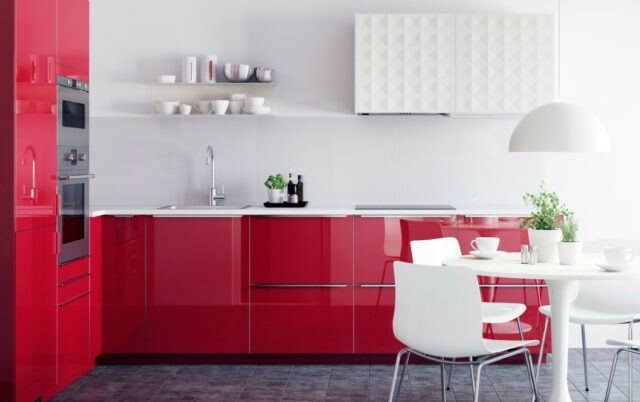 It is important to make this selection at first hand, not so much because of the red tonality but because of the effect it will have on the kitchen. 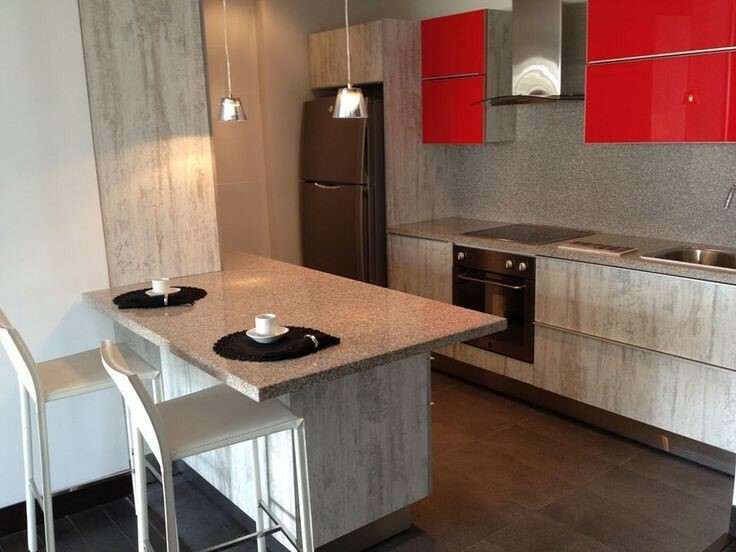 If you have a small kitchen, you can already see in the photographs how it is better to combine it with white furniture so that it does not look too small, but there is a balance of color and intensity without losing vitality. Kitchens in wood tones, either in natural color or in chocolate, are another of the great ones since they remind us of the designs of before. On this occasion, IKEA have a kitchen in chocolate tone with some more rustic but clearly modern. In this image, we find a kitchen design in wood but with a more industrial style with that touch of metal extractor tube, island and appliances. 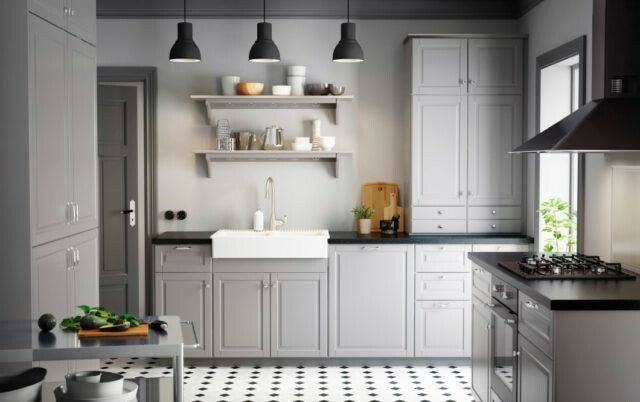 The gray kitchens draw a lot of attention in IKEA, they tend to have a soft tone but we cannot forget that good natural light is needed to make them look good in small kitchens. If you really like gray, combine it with white furniture so that it reflects more light and looks broad. The details of the kitchen may be black. Kitchen, one of the cores of the house, adapts to the way of life of its owners, but also to the lines that set the trends, which come full of color. Greens, blues, yellows … they jump in an unexpected way both to the furniture and to the coverings, always using white as “base”. To this trend full of energy and vitality adds another, much more romantic that of pastel shades: touches of sweetness for your home. If you’re a classic, do not fear: black & white and wood are still valid and willing to stay. Take note of the trends and be inspired by them to renew your kitchen. Think about your tastes, your needs and let yourself be advised to get what you want. Oh, and do not just stay in the fashions and point to these two fundamental pillars: quality and price. Combining the three things is possible; IKEA is doing it with its new integral kitchen service. 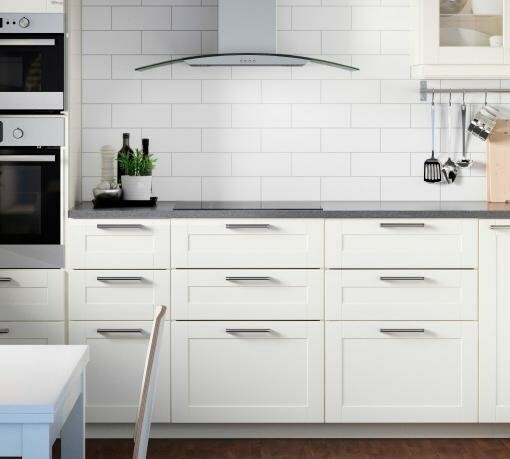 An IKEA kitchen is a complex environment, that customers can start to design already through the website, thanks to an online simulator made available free of charge to customers. In the new IKEA kitchen system, called Metod, all the cabinets, doors, hinges and drawers are newly designed. The basic modules, which have sizes from 20 to 80 cm, can be combined with great freedom to develop the creativity and personality of the customer. After many years of Faktum system as top of the range, the Swedish company launches the new Metod system that allows you to adapt efficiently to the home spaces with an eye to aesthetics. Metod is characterized by a totally customizable modular structure that proposes a renewal of the package of doors and shelves in many shapes and sizes. To design a kitchen in a practical and functional way, we need to follow some basic steps, which allow us to obtain a good result; First of all, you must first measure the wall you intend to use to support the chosen kitchen. A simple linear kitchen, for example, in order to accommodate all normal equipment and appliances needs a wall of at least 330 cm. It is also essential to observe if the wall is narrow between two side walls, which will force you to program a kitchen that exactly fills the available space. Obviously the kitchen retailers provide a quote even in the absence of a project, and referring only to the dimensions of the wall. Nonetheless, if a project is carried out autonomously in the initial phase of the purchase research, the proposed prices can be better compared. Before seeing in detail what are the great possibilities of using IKEA kitchen planner it is good to remember some essential rules for designing a kitchen in such a way that the environment is efficient and well organized. First of all the designers teach that it is necessary to plan free and easy access to sink, refrigerator and gas, the most used accessories, which, together with the refrigerator, must be easy to handle. If the size of the kitchen is restricted, it will be necessary to study clever devices using the most of the furniture, wall units and study the best places to organize the space. When the space in the kitchen is habitable and large you can assume to organize it by developing an island in the center or a bench that will be placed in a corner of the kitchen and where you can also have lunch or even consider it as a permanent place for meals. Thanks to the versatility of the Metod IKEA system, it is possible to choose modules ranging from a width of 20 cm up to 80 cm, freely combining them to obtain the desired result. 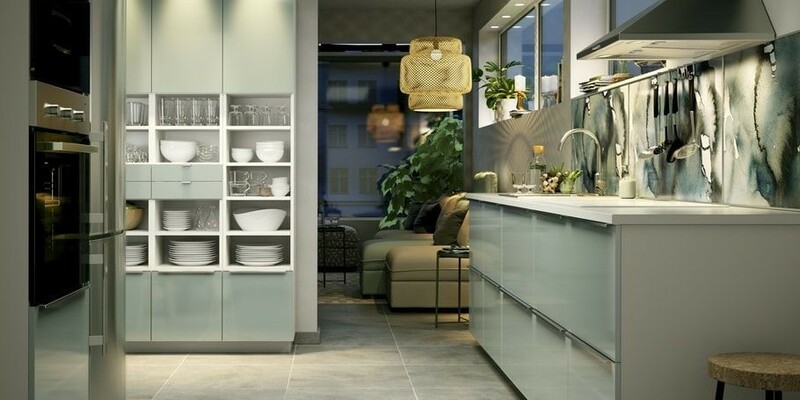 The IKEA planner allows you to have a concrete help to find the best combination of the Metod modules, combining them with the preferred doors among the many available for IKEA kitchen design. The kitchen is an environment in which lighting must be decided. It is not just about the atmosphere, but above all about safety in handling dishes and food. You can consider adding lighting directly above all the main work areas, using hanging lights or a series of mini-pendants in areas where they can improve the lighting and beauty of the kitchen. Furthermore, we never forget to put tiles behind the appliances or kitchen cupboards, to avoid humidity, kitchen grease, vapors and the preparation of a panel, which is metal, plastic, tiles, wall paint, will be useful for safety and cleaning itself, simpler and faster. 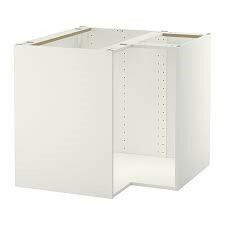 Also for these IKEA elements offers several different solutions that can be combined in order to meet your needs. Designing IKEA kitchen means being able to choose every little detail, not only the configuration of the modules but also the accessories and the internal elements, to organize the storage compartments in the most congenial way. 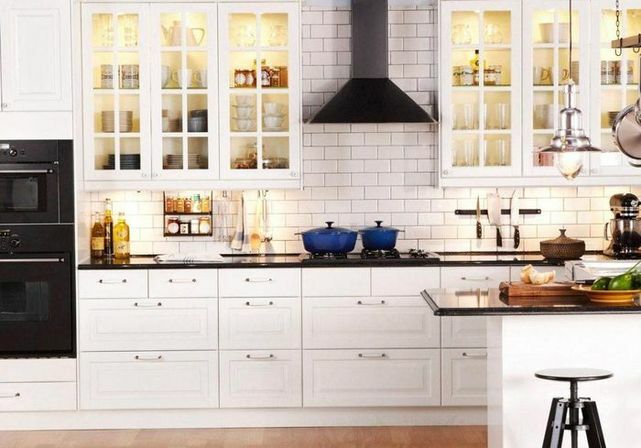 In addition to IKEA kitchen planner there are also other online programs for kitchen design, which can also be easily used by ordinary users, even if the IKEA kitchen planner is certainly the simplest and most famous, because it is easily accessible and immediate in use. Thanks to the kitchen planner you can imagine everything you prefer in a hypothetical ideal kitchen: shapes, colors, fronts, furniture and materials. These are free applications that work on Windows, Macintosh, Linux with Internet Explorer, Firefox, Safari and most browsers. You can create a plan simply by entering the measurements taken in your room used as a kitchen. With these kitchen planner programs you can send projects by email, you can print and record project images on your computer and get a detailed list of all the elements that make up the design: the areas of the floors, the material applied and all the elements of kitchen furniture. The Swedish colossus makes IKEA kitchen planner available, thanks to which it is possible to design kitchens both in 2D and in 3D. When the measurements of walls, windows, doors are added, adding cabinets and appliances to the project afterwards, the three-dimensional representation is updated automatically. In fact, while the user designs his kitchen, the 3D Planner automatically compiles a detailed list of the selected products, with names, descriptions, materials and prices: all useful information when the drawings will be reviewed with an IKEA expert. Thanks to the three-dimensional view, the IKEA planner is simple to have a real idea of the kitchen that in the design phase. Furthermore, the IKEA planner kitchen software is intuitive and therefore also suitable for inexperienced users. 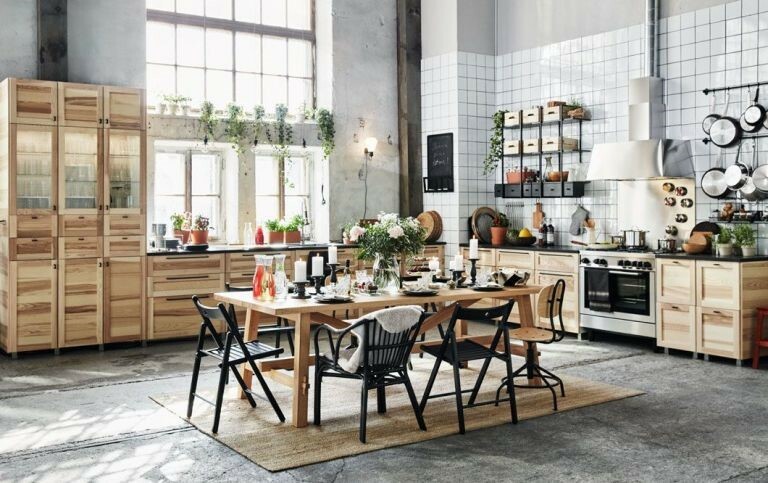 IKEA, in its catalog, offers a wide range of kitchens that combine design with the beauty of wood, iron, aluminum and glass, once again making the kitchen a real living area of ​​the house. The goal of IKEA is to combine the living area and that of the kitchen in the same room. IKEA 2018 kitchens represent the ideal furnishing solution for those who love living the house at 360 degrees. In addition to beauty, the famous Swedish giant reserves the right to functionality, making the internal environment not only aesthetically appealing, but also hospitable and comfortable. IKEA kitchens respond best to the new way of living, in line with one of modern lifestyle, deeply changed. Versatility, fluidity, personalization, these are the characteristics that unite and best describe the kitchens of the new Ikeas 2018 catalog. 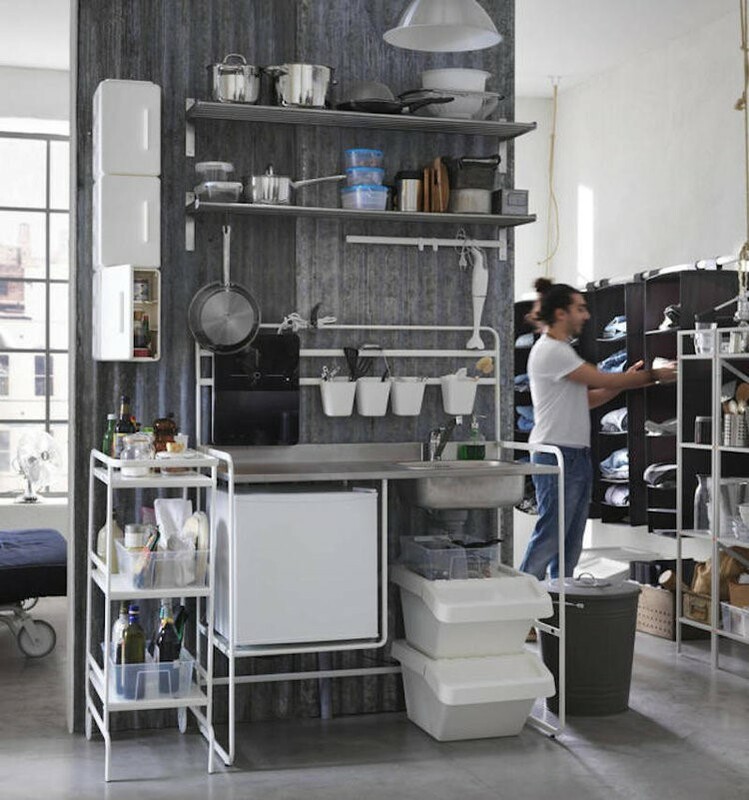 Metod Kallarp is an extremely practical, compact and tidy modular kitchen. Compact, large 10 square meters, extremely functional, worktops organized for maximum efficiency. Metod Kallarp is also an extremely economical kitchen. 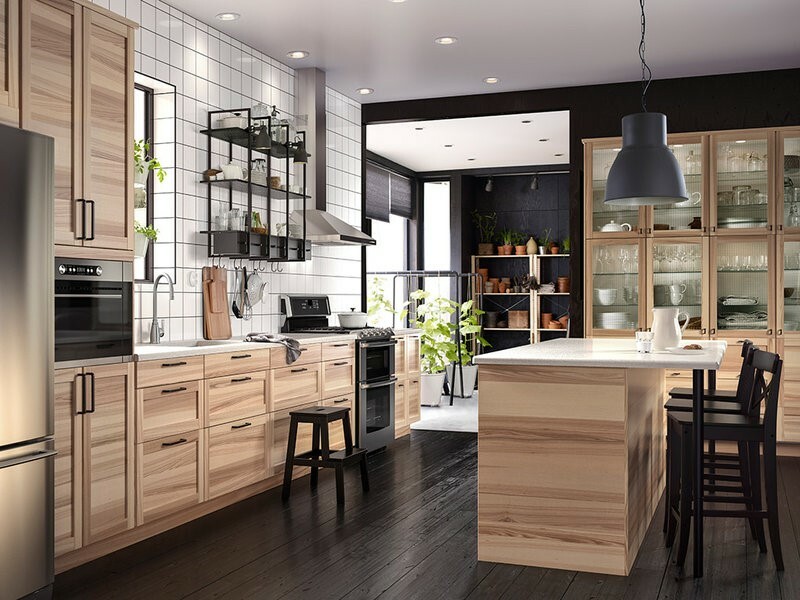 The IKEA kitchens of the 2018 catalog do not betray the expectations and are really beautiful, always in line with a style that wants them to be fluid and adaptable to the environments of our homes. 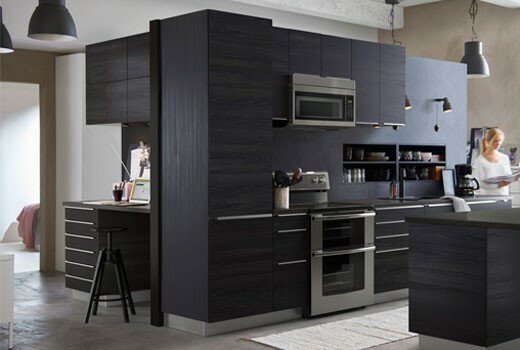 If you dream of a dark wood kitchen (elegant and compact) Metod Tingsryd is the perfect option for you. The visible wood texture is combined with the opaque background of the kitchen. Maximum creativity and maximum compatibility, this kitchen is extremely customizable and inspires imagination. 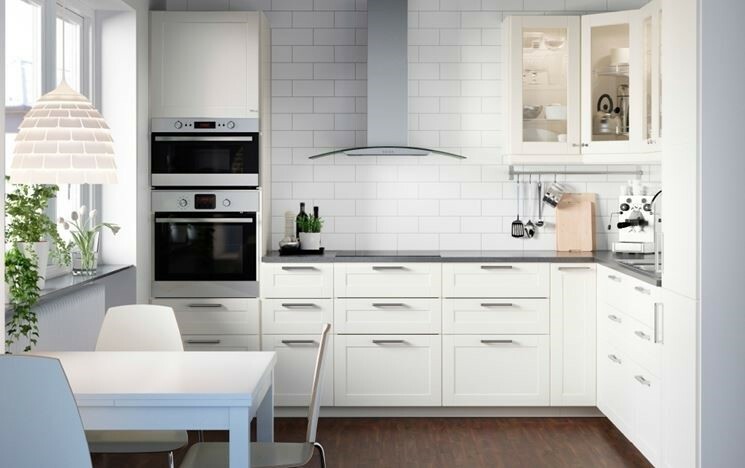 IKEA kitchens are beautiful, functional and versatile, every year the Scandinavian brand offers us comfortable and contemporary models that fit all homes and are guaranteed for 25 years. Metod Torhamn is the kitchen for the most nostalgic, those who still like to dream with a natural wood kitchen. It is product that fully reflects Swedish style and will make you fall in love. Do you dream of an extra-cheap kitchen that is really beautiful to look at, compact and modular? IKEA offers Metod Ringhult, a modular kitchen with a unique design. 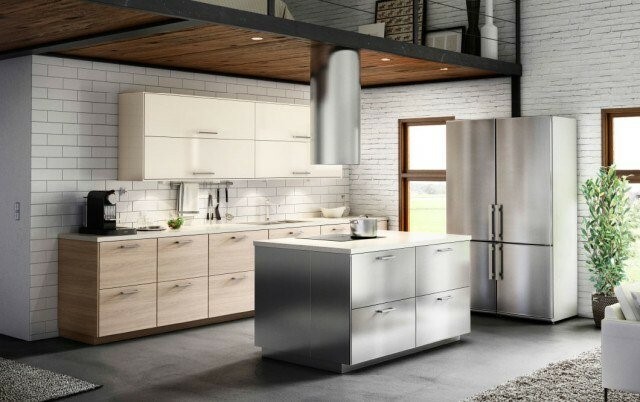 IKEA also thinks of the chronic penniless and proposes the economic kitchen Sunnersta which has a steel structure and that can be completed according to your needs by adding other elements proposed by the Scandinavian brand. IKEA Metod is characterized by elementary units based on a modular logic that is based on multiples of 20 cm in width and height to meet every need with great freedom of configuration. New finishes, new increased heights and lower clogs will allow you to have a greater capacity and a unique style. Furthermore, the system makes it possible to adapt solutions to spaces of any size. It is certainly one of the most popular versions of modular kitchen and the reason for this wide spread is easy to spot. This is in fact the most universal type of kitchen, the most versatile and best suited to each room and the taste of every landlady. Possibly it is one of the great victories of the Nordic giant. It is certainly one of the most popular versions of modular kitchen and the reason for this wide spread is easy to spot. This is in fact the most universal type of kitchen, the most versatile and best suited to each room and the taste of every landlady. The Minimal kitchen is characterized, as its name suggests, by clean lines and the sobriety of its style. In this type of kitchen it is in fact above all the practicality to be the master and the design criteria are those that tend to favor this specific quality. Steel, laminate, lacquered wood, absolute lack of frills and careful care to avoid any possible characterization, are all those things to be preferred when you want to achieve this type of aesthetics. Yeah… but is it really appropriate to talk about “aesthetics” when it comes to minimal? Yes of course. As claimed by many of the architects, who gave meaning to the word “design” in the 20th century, the true exercise of style must be pursued by “taking away” and not by adding something of its own, in the projects that are carried out. This reasoning, in the furnishing of a kitchen, can find its maximum expression. After all, what is really needed to furnish a kitchen, it is above all to think about the functions that the latter must have and how it will be possible to inhabit the environment once it has been set up. From this point of view, the materials play an irreplaceable role. The modern kitchens of minimalist taste prefer the most resistant materials, such as the “laminate”, which in the many versions in which it is on the market remains one of the most widespread finishes, both for its excellent relationship between quality and price, and for the its ease of use and maintenance. 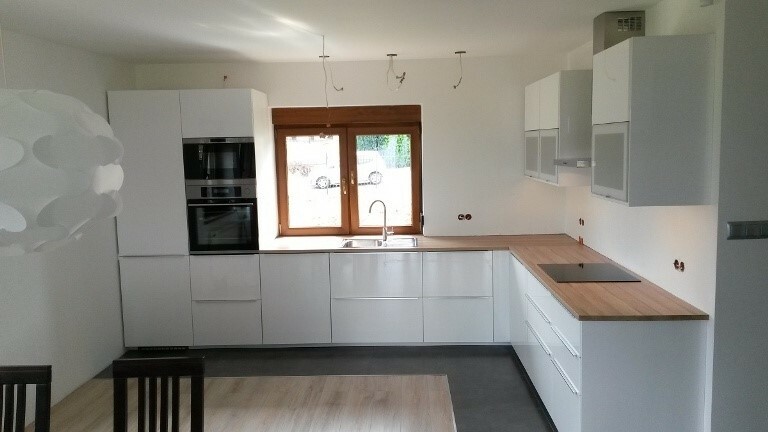 The term “HPL”, for example, indicates a type of high resistance laminate which, being characterized by a single compact, mono-material thickness, is considered one of the best materials ever for the construction of the kitchen with a minimalist taste. However, those who want to be rather minimalist also with regard to the cost of the kitchen itself can always opt for the versions in Melamine. To be minimalist, however, it does not necessarily mean giving up the most beautiful and elegant materials. A finishing technique that can be applied on wood panels such as chipboard or MDF is in fact also the “lacquering”. 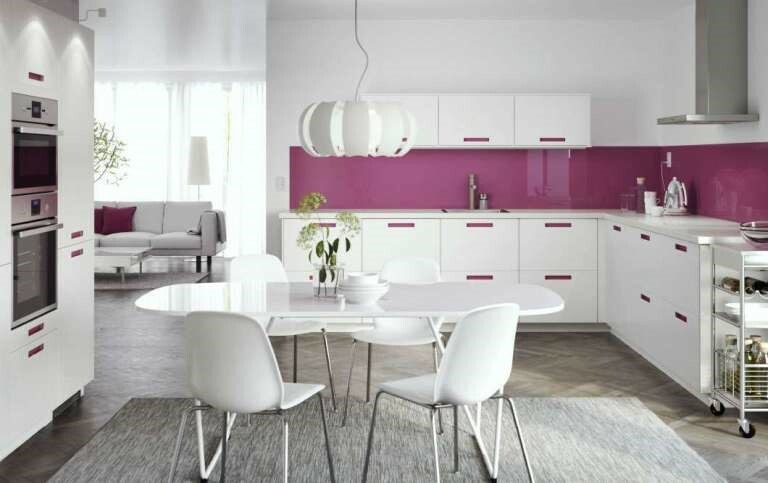 In this case it is a painting process that is carried out with polyester or polyurethane products that are particularly suitable for the surfaces of the doors of the minimal kitchens because they can have both a glossy and opaque effect. If your kitchen is small in size, it does not have enough lighting; you have a huge problem because it may seem like an unacceptable cave. Our recommendation is that you explore all the possibilities for better coverage. If you can expand the window, continue. And if not, think of plan B: from glass walls to sliding doors. 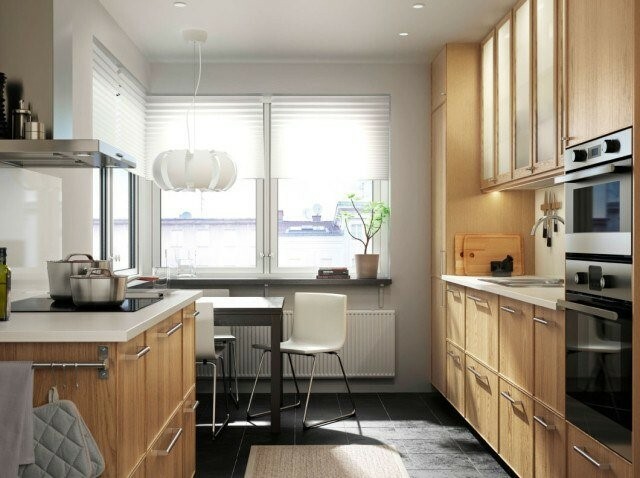 IKEA loves the open or transparent kitchens, but they are not always completely comfortable because of the smell and humidity, so it’s best to pull out the intermediate solutions. Do not abuse too many cabinets because it is usually heavy for the eyes. If there is a detail that particularly characterizes the minimalist kitchen, this is undoubtedly the absence of handles. White furniture without handles is always good! This absence of the rest perfectly reflects the philosophy behind this type of style which, in the continuous search for simplification, has led the designers to devise the most functional opening methods, which could become functional without affixing additional frills to the doors, such as handles can often appear. To achieve this purpose designers use the very comfortable “grooves” embedded in the shells of the furniture, which make it possible to grasp the doors at the back so as to open them. Using space in the corners has never been so simple. 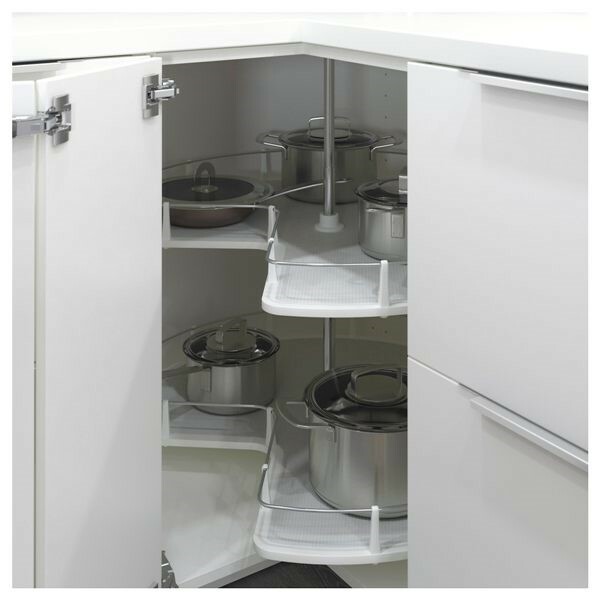 Metod corner cabinets can be completed with rotating or extractable shelves and accessories, which allow you to make the most of a space that, would otherwise remain unused. When planning a new kitchen, choosing the layout of home appliances and hairstyles, the first thing to consider is the layout of the kitchen itself. The layout of the kitchen is the form that is obtained through the arrangement of the worktops, the most cumbersome appliances and storage and storage spaces. This arrangement creates the working triangle that is the path lines between the pantry, the sink and the hob – or the oven. Although spacious environments obviously help to make kitchens more comfortable and efficient, in reality any kitchen can be improved with the right arrangement of its components. The linear kitchen, or single wall, is the most common option for small spaces. It runs along a single wall, possibly at least 3 meters long, and without windows or doors. Linear kitchens are an efficient solution even for long and narrow rooms. Generally all household appliances are cashed under the base plan, to maximize the work space and free space is left to move. Always to protect the worktop, there is ample use of wall units, but, having enough horizontal space available, a floor to ceiling pantry can be a really comfortable. IKEA has made kitchens its strong point. Thanks to the standard lines the price reduces a lot, and with the wide choice of doors and handles you can customize your choice. Those who prefer modern style can choose the linear kitchen with Voxtorp doors, available in both the walnut and white versions. The integrated handle gives elegance and modernity to the whole, also proving particularly practical in use. In the kitchen extractable and revolving mechanisms allow you to make the most of the spaces with compositions equipped with special elements. 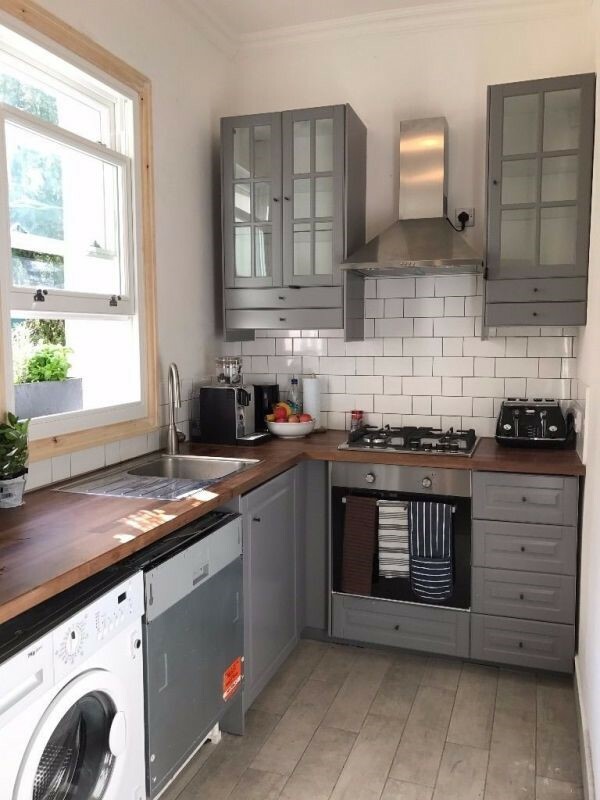 Practical and super-equipped, the new kitchens are increasingly treated in detail, to be more functional and allow complete exploitation of space. In “corner” compositions, for example, the angular compartment, difficult to reach because it is too deep and not very accessible, is solved with ad hoc solutions. If well organized a composition, even if small, is able to contain everything necessary, without forcing to give up comfort. In fact, to make the difference between the different kitchen models, in addition to the finish of the doors, are the accessories. So the solutions with drawers, total extraction baskets or rotating extractable shelves are more practical and capacious compared to traditional shelves. In order not to lose precious space, even the surface of the kitchen top can be optimized, for example, with corner cabinets, whose particular shape allows greater ease during work at the stove, especially when the four burners are used simultaneously. Another solution are the Metod Corner base cabinet with carousel to be inserted in the space between the kitchen and the wall units, designed to contain kitchen utensils and small appliances; if they are then equipped with removable baskets, everything becomes more functional and easy to clean. The gallery kitchen offers a particularly efficient use of space. The two opposing walls offer a wide choice of positions for the various appliances and work stations, to the point of allowing more than one work triangle – having sufficient space available, of course. The corridor layout can be the best even in the case of small spaces, since the kitchen is not open at both ends and does not become a usual passage point between the various parts of the house, which would also interfere in a way dangerous with the kitchen activity. 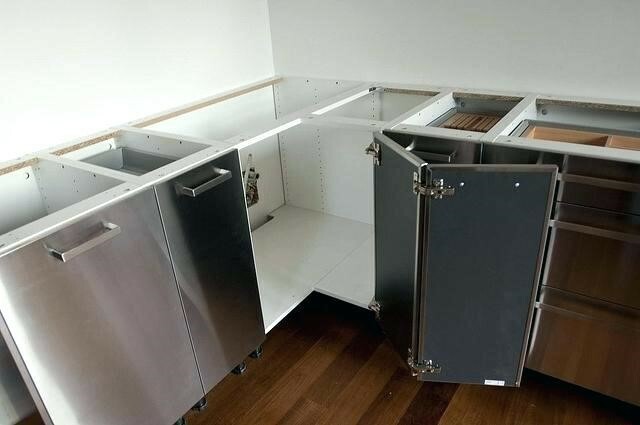 It is important that there is enough space between the two fronts (at least one and a half meters) because drawers and doors can be opened at the same time even if placed one in front of the other. Any kitchen can be implemented by adding an island to the layout, with the only restriction to require considerable additional space. 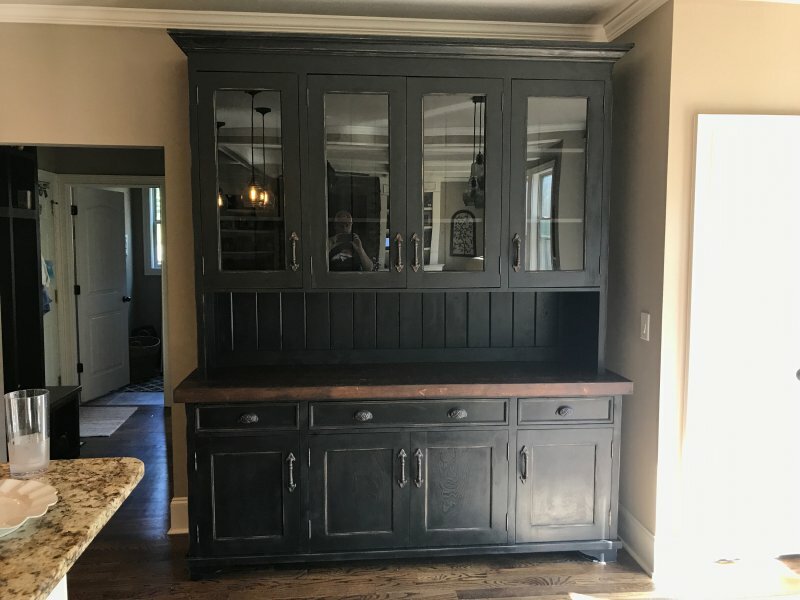 It is a perfect solution to entertain guests and family during kitchen operations, especially if one side of the island is facing a living space. Aperitifs or refreshments, for example, can be served without interrupting the work of the cook, allowing him to socialize during the preparations. An island helps to perfect the working triangle, especially in kitchens that have only one or two walls, and become the focal point of the kitchen, whether you place a sink with a large space for the preparations, or that you place an exposed hob. The IKEA’s catalog offers us an incredible variety, with solutions for all kinds of kitchens and all kinds of budgets. Would you recommend buying a kitchen in IKEA? Elena Martinez, who lives in Madrid, writes: “Definitely yes. My experience is positive. There are things that can be improved but this does not invalidate the rest of the work. I love the furniture in my kitchen. I really like how it is, I love the quality of the set, how beautiful it is, how easy it is to clean, the general feeling. It totally meets my expectations and cooking is my favorite stay at home. We have achieved the objective pursued and at a more than reasonable price. I’m delighted! Beyond what I have told the people who have attended me, I know they have tried to do their best and I believe in their professionalism. I am very happy with the result and without a doubt if you want to change the kitchen it is worth having them in consideration”. “Utrusta, corner base cabinet carousel is awesome. The truth, I’m not going to cheat, cheap is not … but what takes advantage of the corner with that closet is not of this world. There is not a centimeter left wasted but it is also easy to extract so we use it a lot. It’s our pantry! We have also hung a support for plastic bags so we use it a lot”, – writes a couple from Liverpool. Marianna from Rome says that she is also very happy with your kitchen cabinet: “It measures 20 cm wide and it’s great for me to have the oil, the soy, the vinegar … in the lower part and above the spices. This leaves the countertop quite collected and does not fill with grease. Another thing that comes to us phenomenally is the base cabinet for recycling. We use the furniture under the sink to store the recycling bins. I have three: one large and two small. We also have a drawer to leave the plastic bags, the dishwasher, wipes. It is highly recommended because it is very accessible and very comfortable”. “This is another thing that I had not had to date and with which I am very happy. It’s not exclusive to IKEA, but I’m happy to have it like that. I do not slip, it is at a much better height and also with the drawers underneath I have managed to stop having the pans in the oven (quite an achievement! )”, – talks about the base cabinet for oven Katherine from St. Petersburg. “Three years ago, you could only opt for a system of Faktum cabinets and Rationell drawers. As you know, the Faktum series has been replaced by the METOD system, with two series of drawers: Farvara, more economical, and Maximera, very similar to Rationell. This has spoiled one of the reasons why I bought the kitchen, that if any structure, drawer or door was damaged, I could change them for new ones without too many complications. Fortunately, both the doors of the Applad series, similar to the current Veddinge continue as the first day. This also applies to cabinets and drawers. Nothing has been damaged, not a hinge, nor a guide, nor the automatic closing system … even the shutter goes like silk. The finish of the doors is also intact, and regains its shine every time you clean them. It has not skipped the lacquer in any corner nor has any chafing. In that sense, I am very happy with your resistance and desperation. It’s worth noting that three years are not many, but since I put a lot of weight in the drawers and give the kitchen a lot of use, it could be said to be as good as new. For me, I love to cook and eat; you can imagine that the kitchen IKEA is one of the most special places in my house. Not only is it a transit place where one can get food, at all. The kitchen is a magical place where you create, where you combine flavors and textures, where you create different dishes for each of your guests and family, – posted in one of the forums Susanne from Marseille.